To show how Schmidt can meet challenges to create a personalised project, the company fitted a working kitchen and wardrobe on a rock face for professional mountaineer Kenton Cool. 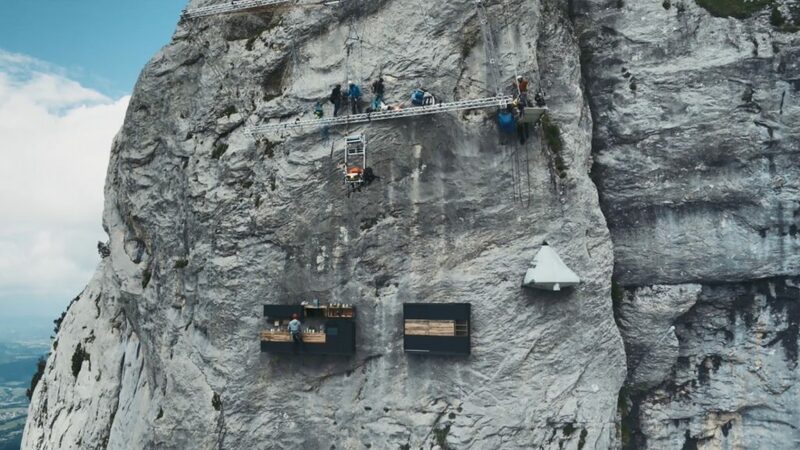 The installation of the “Vertical Home“, against the rock face of the pre-Alps, has been featured in an eight-part documentary on YouTube and a dedicated website. Installed 2,000 metres above ground, Kenton Cool uses the kitchen and even cooks breakfast, suspended on the cliffs of Le Parmelan. CEO of Schmidt Groupe Anne Leitzgen commented: “To show our commitment to our customers, no matter how far-fetched their dream, we set ourselves an extraordinary challenge to design a kitchen and wardrobe for an exceptionally demanding customer – the world-renowned mountaineer Kenton Cool. “The twist was that we did not install these at his home in England but on the side of a mountain at an altitude of nearly 2,000 metres. The French furniture manufacturer was established 80 years ago and now has 450 showrooms across Europe, including 22 in the UK. Schmidt makes 600 kitchens a day and has plans to extend its UK network to 100 showrooms within the next 10 years.